The purpose of this study was to measure changes in plasma adiponectin (ApN) over 24 months of exercise intervention in middle age adults with a predisposition to metabolic syndrome and to determine if changes in ApN were more affected by physical activity or physical fitness. Thirty-six subjects completed a 24 months home-based exercise program (cycling ≥ three times per week, ≥ 45 min/session at 50–65% of VO2peak). Body composition, blood samples, and physical fitness were studied at baseline and after 12 and 24 months of participation in the study. The prescribed physical activity was monitored via self-reported exercise diary to determine MET levels, hours, and exercise compliance. Two-tailed repeated measures ANOVA and Spearman Rank Correlation Coefficients were used to detect significant differences and associations between the variables. ApN increased significantly (P < 0.05) after 12 months in males (n = 17; 5.3 ± 1.9–7.0 ± 3.0 μg ml−1) but not in females (n = 9; 8.6 ± 3.8–11.5 ± 4.0 μg ml−1). The net change in ApN over 24 months was significantly correlated to the net change in VO2peak (physical fitness) (r = 0.66; P < 0.001), whereas exercise intensity was negatively correlated to ΔApN over 12 months (r = −0.4; P ≤ 0.04) and 24 months (r = −0.45; P ≤ 0.02). Based on our results, an improvement in cardiorespiratory fitness of 15% increased plasma ApN concentration. 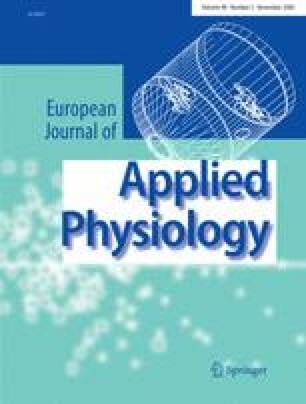 Our findings suggest that moderate physical activity performed over many months induces positive changes in the plasma ApN concentration in adults with a predisposition to metabolic syndrome.